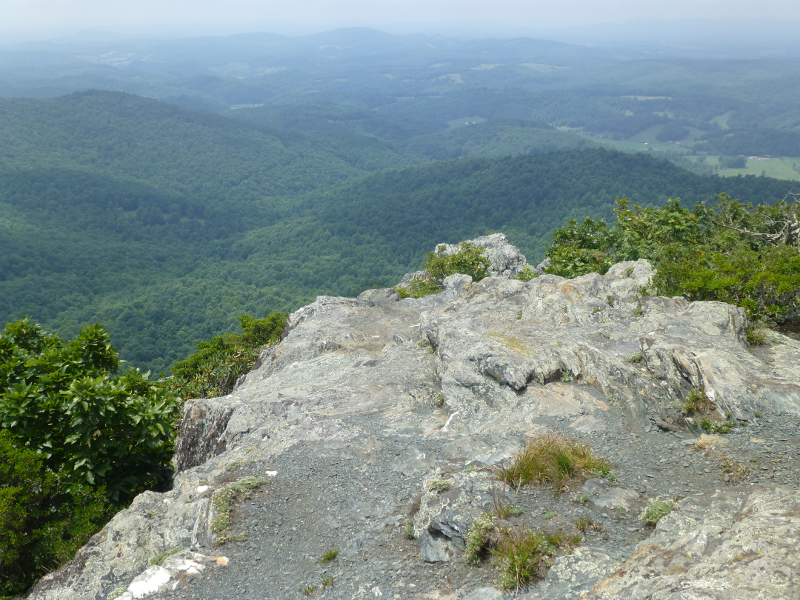 Geology helps to explain why hikers can see a vista of mountains from the top of Dragons Tooth on the Appalachian Trail, why the Chesapeake Bay Bridge has two tunnels, and why the western part of the state is mountainous but the eastern part of Virginia is flat. Bedrock varies across the state, and erodes at different rates. Climate, primarily temperature and rainfall, shapes the speed at which bedrock decomposes and new minerals form. Positively-charge ions of iron, magnesium, calcium, and other elements go into solution, leaving behind clay minerals. Roots penetrate the clay and organic material forms soil. The state's major physiographic regions - Appalachian Plateau, Valley and Ridge, Blue Ridge, Piedmont, and Coastal Plain - reflect the patterns of bedrock. Virginia is on the eastern edge of the North American continent - but we are not on the eastern edge of the North American tectonic plate. Virginia is closer to the middle of the tectonic plate than to the eastern edge. The eastern edge of the tectonic plate is the Mid-Atlantic Ridge in the middle of the Atlantic Ocean. The western edge is the San Andreas fault on the California coast, leaving Virginia in the middle. 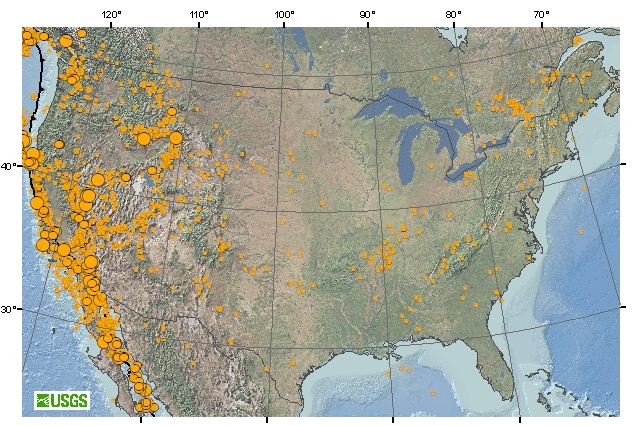 There are constant earthquakes on the edges of the plate, where rock is oozing up to the surface (in the Mid-Atlantic Ridge) or rubbing against other plates (in California). Since Virginia is near the center, friction against other plates is minimal here - that's the main reason Virginias feel so few earthquakes. "Few" is more than zero, of course. 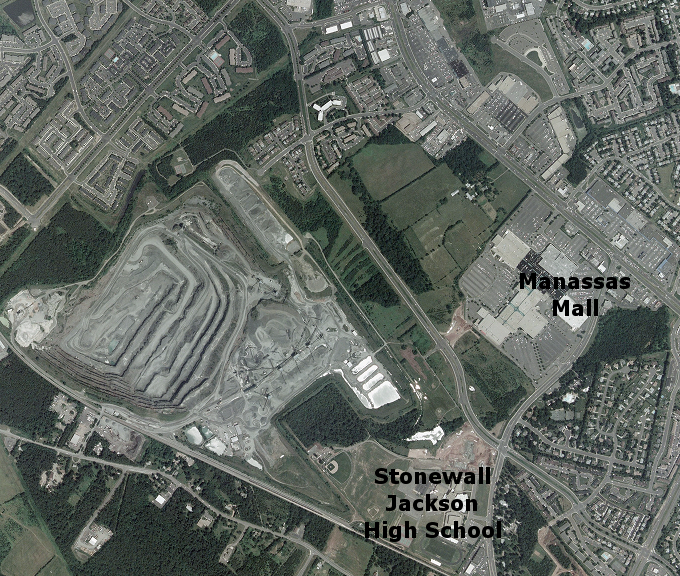 If you were in Northern Virginia during the afternoon of August 23, 2011, you felt a 10-20 second rumbling from a 5.8 magnitude earthquake centered near Mineral, Virginia. Items fell from bookshelves, cracks appeared in the Washington Monument, the nuclear reactors at North Anna were shut down, and many buildings in Washington DC and Richmond were evacuated. That is roughly the rate at which the Mid-Atlantic Ridge is spreading - and, coincidentally, the rate at which our hair and fingernails grow. When you get a haircut, the length of your hair that is cut equals the distance we have traveled towards Asia. Measured in English units, one inch per year is almost a foot per decade, or roughly three yards each century. Since the Godspeed, Discovery, and Susan Constant first arrived in 1607, Jamestown has moved about 10 yards westward with continental drift - the length of a first down in an American football game. Since the first immigrants from Asia walked into Virginia (or maybe they rowed/sailed from southwestern France?) about 12-18,000 years ago, Virginia has drifted about the length of a football field. In the last million years, Virginia has moved 15 miles to the west through continental drift. The collisions that created tall mountain ranges in Virginia were followed by erosion that has etched away those mountains. 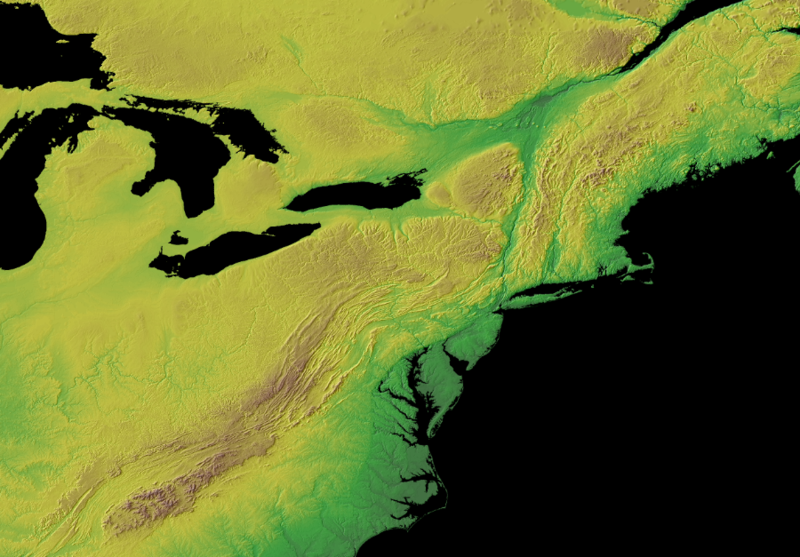 The eroded sediments have created the flat Appalachian Plateau west of Virginia, and the flat Coastal Plain east of I-95. The shorelines of the Atlantic Ocean and Gulf Coast have changed as the mountains washed away and as sea level has changed. 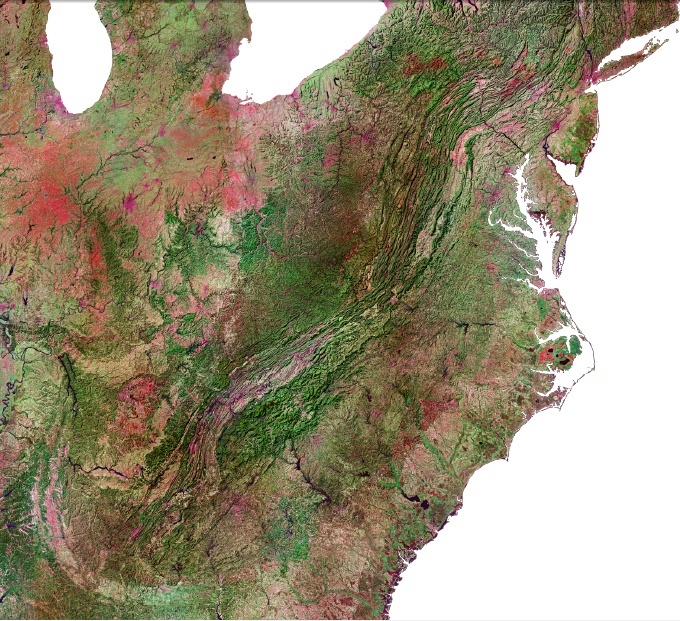 Virginia is not as flat as a pancake today, despite 300 million years of rain and wind and gravity. 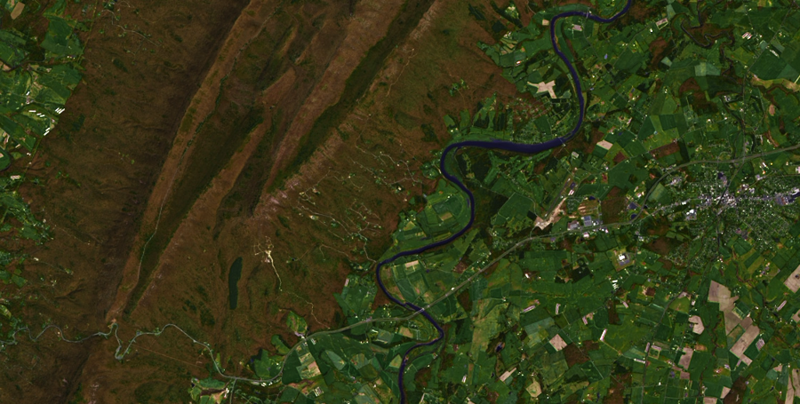 Some ridges have resisted erosion, and "differential erosion" has created a low Shenandoah Valley adjacent to a high Blue Ridge. All those years of erosion should have worn Virginia down to a flat peneplain, but the key reason we have ridges today is recent uplift. Tectonic forces squeeze the North American Plate as it moves, creating stresses that might be pushing some rocks up. More significantly, the deeply-buried "roots" of the ancient Appalachians continue to float upward as erosion lowers the weight of the surface deposits above those roots. In addition, parts of Virginia are moving up or down in response to the very recent disappearance of the Laurentide ice sheet. The last ice age ended only 18,000 years ago. The earth's crust in Pennsylvania is still rebounding upwards after the removal of the heavy weight of ice, and that rebound may be flexing the crust around Norfolk so it moves down. The downward motion is substantial enough to increase the threat of flooding as sea level rises. To understand why there are individual ridges in some places and valleys in others, it helps to know the history of three major mountain-building events when chunks of silica-rich crust - even an entire continent - collided with Virginia. Since the locations of towns, highways, even soccer fields is determined in part by the geology of Virginia, it helps to understand the bedrock and the topography if you want to understand the people and the culture of the state. Could we have mountain music or "mountain dew" (moonshine whisky) without mountains? 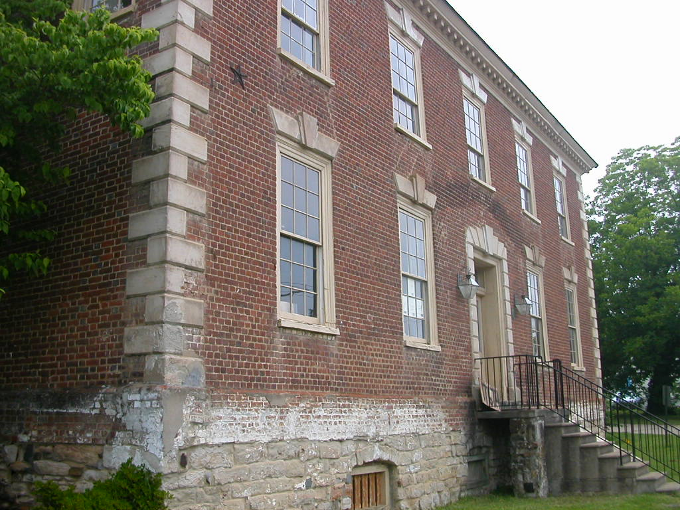 The links below provide an overview of Virginia's rocks and ridges. 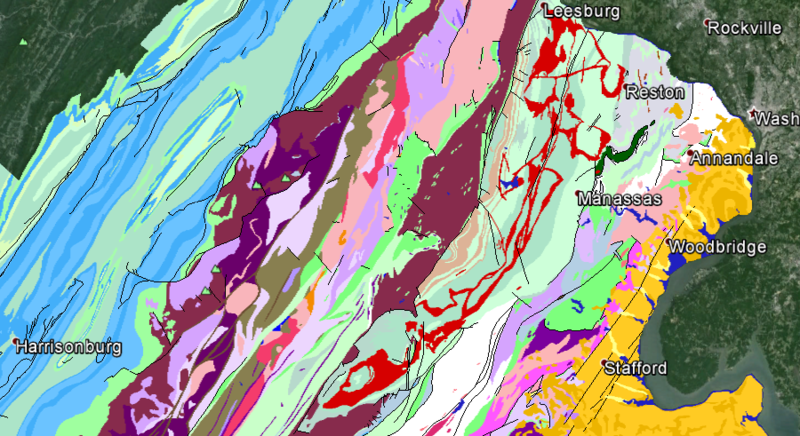 For the solidly-scientific perspective, see The Geology of Virginia (from William and Mary), and The Geological Evolution of Virginia and the Mid-Atlantic Region (developedoriginally at James Madison University). Which Way Do the Rivers Run? St. Mary�s Acid Mitigation Project: Is it time for another dose of medicine? NOAA Marine Geology & Geophysics Images (showing the age of Virginia's ocean sediments in the western Atlantic is nearly 180 million years - some of the oldest seafloor in the world. "Mountains" - A notice on its Mountains?